Double winnings if your team wins both halves - paid as a free bet up to £50! Coral run the Win Win Get In promotion usually on two selected games each weekend, plus occasionally midweek too if there is major football running. Your expected profit from this offer is usually £2 to £3. For 5 minutes work, this is well worth doing! Back the football team which is the favourite to win . Choose the maximum stake as explained below. Lay your chosen football team using Normal in the calculator. The lower the odds of the team, the more likely they are two win both halves. The expected profit = £50 free bet x % chance of your team winning both halves. Note the £50 free bet is assumed to be worth £35 cash profit. You will typically make a trigger bet loss around £2 to £3, this may be higher for 1.5 back odds (as the maximum stake is £75 as explained below) and lower for 2.5 back odds (as the maximum stake is £33). For a team with odds between 1.5 to 2.5, after qualifying loss, you will make an expected profit of £2 to £4! Coral are running their Win Win Get In promotion on Chelsea vs Man Utd. Chelsea have back odds of 2.0 and lay odds of 2.08 whilst Man Utd have back odds of 3.5 and lay odds of 3.8. We choose Chelsea because they are the clear favourites and place a £50 back bet and a £48.08 lay bet as provided to us by the calculator. This has a qualifying loss is £2.43. However, if Chelsea win both halves (e.g. 1-0 and 2-1 for a final score of 3-1), then you receive the £50 winnings plus a £50 free bet (cash equivalent of £35)! How Do I Calculate The Maximum Stake? The most you want your potential winnings to be is £50, as this is the maximum amount Coral will double as a free bet. Given the favourite's back odds are usually between 1.5 to 2.5, this means the maximum stake is £33 to £75. This would look a bit strange if Coral saw you place this exact amount, so I would recommend rounding to £60. However, how do you know the % chance of a team winning both halves? This table shows why it's not worthwhile choosing a team with odds of 3.0 or higher, because their chances of winning both halves becomes too low! This table factors in a bookmaker margin for the odds they offer so the %s should be accurate. However, there is very little liquidity in the market so the odds are too poor. Note this is not the same as HT/FT which means a team needs to be leading at half time and full time. For example, they could win the first half 1-0 and then keep the 1-0 by drawing the second half. If your team wins the first half you can make this offer risk free by using the Asian Handicap market. Check out this brilliant OddsMonkey thread for details on this. 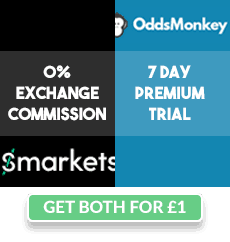 If you are new to OddsMonkey, check out the OddsMonkey review.